At Ellerslie Veterinary Clinic we offer a wide variety of cytology tests (including ultrasound guided fine needle aspirates and biopsies) as we are huge advocates of aspirating every lump and bump on your pet, even though they may turn out to be benign cysts or lipomas (fatty tumors). In our experience, a “wait and see” philosophy can be a disaster and potentially cost you precious time in getting a diagnosis and treatment. The story below will illustrate you why our vets are so sharp-eyed, but first, a bit more about cytology. Cytology is simply the study of cells and is an extremely useful diagnostic tool that is used in many veterinary clinics, on different levels. If there is a lump on the surface or just under your pet’s skin, you should get it aspirated (FNA = Fine Needle Aspiration). It’s a simple test and no anesthesia is required. A very thin needle is put into the lump, and then whatever fluid or tissue cells which are inside, are drawn up into the syringe. Usually a pathologist in a specified laboratory will check what the aspirated material is, at Ellerslie Veterinary Clinic we will look at the material ourselves. The technique appears to be simple, but consistently obtaining good-quality samples requires practice and fine needle aspirations can result in the spread of the cancer, so care should be taken. However, FNA is also used to evaluate internal organs such as the liver, spleen, lung, lymph nodes or kidneys and should always be guided by ultrasound. This can also be useful for ‘tumor staging’ (to assess if and where a cancer has spread to) which helped us with the case referred to below. If something problematic turns up, you can address it quickly. On the other hand, if the masses are benign (not harmful) and not bothering your pet, they probably do not need to be removed. Usually our vets will then recommend leaving them alone and monitoring them closely in the future. In some cases, we will recommend surgical removal of lumps at the same time as another procedure (like dentistry) is performed, but we will rarely recommend a removal if the aspirate was benign, because going under anesthesia has its own risks, too. 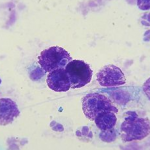 Why cytology matters? Well, here’s the story we promised, and why we are so vigilant about aspirates and proper exams during consultations for our own patients. 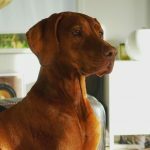 During a routine vaccination consultation with Koko, a beautiful Hungarian Vizsla girl, Kathrin found a lump on the skin. 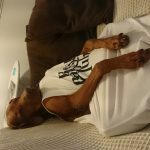 When Kathrin checked it, she hoped for the usual routine: quick aspirate, benign cells of fat tissue on the microscope slide, document the result in Koko’s records, give a treat to Koko, collect some wags and kisses, and send her on her way. In fact, though, Koko had a 5-cm mass that was deeply attached to the underlying tissue on her left flank. When Kathrin did the FNA, she could see blood collecting in her needle and syringe. Kathrin immediately knew that this was not only a benign fatty lump. She aspirated the mass in a few more areas and checked the slides straight away with a microscope exam. The result wasn’t very good: Koko had a mast cell tumor which is a cancerous lump. 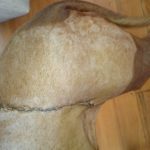 Aggressive surgical removal of the mast cell tumor and surrounding tissue is generally the treatment of choice. Sometimes not only skin and subcutaneous tissues have to be removed, but also fat, muscles, fascia and bones (whole ribs sometimes!). We had to evaluate the surgically removed tissue microscopically again to determine the success of the surgical removal and for predicting the biological behavior of the tumor; if tumor cells had extended too close to the surgical margins, we would have had to perform a more aggressive surgery as soon as possible again. Though Koko already had a very impressive long scar! Luckily, we knew early what we were dealing with and could remove this lump with one surgery from Koko’s flank. There was no indication of spread of this tumor to other tissues which we assessed with abdominal ultrasound, chest radiographs and fine needle aspirates of Koko’s inner organs and the draining lymph nodes. We will still have to monitor Koko carefully and regularly in the future. Hopefully this will be the only cancerous lump she ever had to face! Koko was very brave and is doing very well, as you can see on the images. 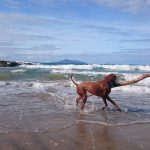 She was on her favorite beach just a few weeks after the surgery. Previous PostPrevious Epsom Vet Centre and Ellerslie Vet Clinic become one!